Sorry about the wait, I was quite busy this week but here is the review! Hmm…what to say? This contemporary novel should win a prize, it left me sobbing, screaming in my head, kissing the book and then left me sitting in trauma. Errhh! My eyes are still sore and red from the crying. Okay… Now for the review. Just One Day was a first for me in many ways. 1) This was my first Gayle Forman book, yes I know sad right? I’m going to be reading If I Stay as soon as I see it somewhere. 2) As far as I can remember, this is my first book set in the amazing Paris. And 3) This is my first book that I stalked for ages then wasn’t too enthused to read. 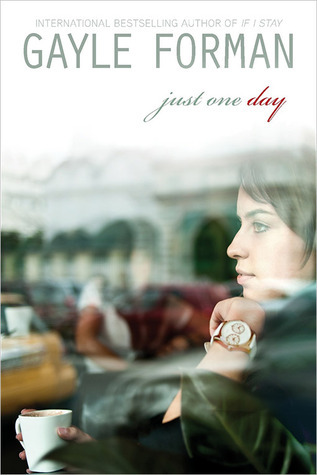 Just One Day, a book of many firsts, blew me away. About to start college, Allyson has been on a tour with her friend Melanie. After meeting up with a cordial, gorgeous looking Willem, by ‘accident’ Allyson goes to Paris with him. (I know right?! Is this girl CRAZY?!!) Waking up the next day from a day of freedom and fun, Allyson finds Willem has gone. Can you really fall in love in just one day and do whatever you can to find them again? Allyson is pretty dull at the start, nothing too likeable. What made me freak out even more was that she decides to go to Paris and ditch her best friend Melanie for a guy she’s met in less than 10 minutes. Thankfully, Allyson is not what she seems, after finding that Willem had left her, she was dedicated, strong and very loving. I grew attached to her greatly. When I read contemporary novels, I always try to steer clear of over done romance. Just One Day had it just magnifique! It may have just been one day of them actually together, but it felt like everyday as Allyson missed him so much. This heart felt, strong story of a love that went as quick as it came will touch anyone’s heart. Anyone should try this book! I just ordered the book online and I am SO SO SO SO EXCITED!!!!!!!!!!! I can’t wait to read it and cry 🙂 love the review!